Moi, j'adore tout particulièrement ce genre de signe d'affection. Pour cette raison, je vous propose un petit free qui paraîtra prochainement sur Des Filles et une Aiguille, un superbe site tenu par de chouettes filles! 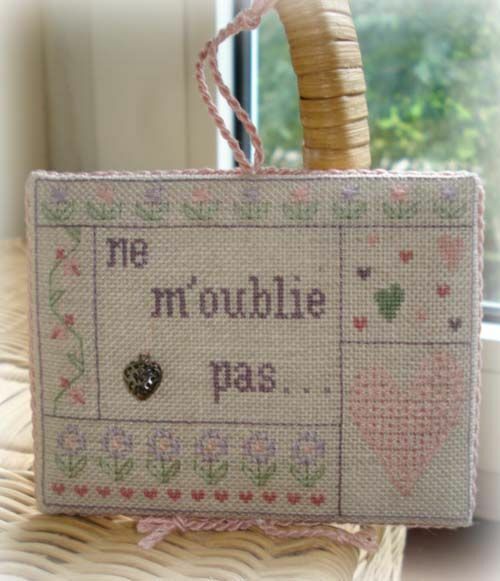 we all like to hear or read sweet words from our friends...Embroiderers like to stitch on the fabric those lovely messages for close relatives. It is always nice to look at that item that reminds you of that particular person. May it remind you friendship or love. I am very fond of such signs of affection. Thus, I decided to create one! This little freebie will soon appear on Des Filles et une Aiguille, a very nice website managed by great girls!